The "News of the World"
The "News of the World" is till today one of the best-known tournaments though it was played for the last time already in 1996/97. The tournament has quite a long history. It was played for the first time in 1927/28. Probably nobody would have predicted it would run for such a long time. In 1927 the English Sunday paper "News of the World" and the C.N.Kidd and Sons Brewery in Dartford had joined forces to support with the help of the tournament the pubs which showed at that time signs of weakness. Pub leagues already existed for some time after the first World War and often local tournaments were played. On the first "News of the World" tournament players from all London could take part. In the end it were around 1000 players who entered and first decided their pub champions and then areal champions who were invited to the final. Thanks to the success the tournament spread further and further. In 1936/37 six regions took part: London and the South, Wales, Lancashire and Cheshire, Yorkshire, the North and the Midlands. In 1938/39 the number of participants had grown to 280 000 players. The regional final of the London and the South region was waited for with anticipation. 14.534 spectators squeezed into the Royal Agricultural Hall in London to see the final between Jim Pike and Marmaduke Brecon. During the second World War the tournament was suspended but some of the crowd favourites travelled as "Tour of Champions"(Jim Pike, John Rosse, Harry Head, Leo Newstaed) through Great Britain to collect money for charities. At this time darts was due to the tournament getting more and more popular and the soldiers played tournaments in the army camps according the rules of the "News of the World". So the allies (mainly from the USA, New Zealand and Australia) got to know the sport and after the war brought darts back to their home countries. In 1947/48 the tournament was taken up again and changed into a national Championship. Over 300 000 players entered for the first round which was played in pubs, canteens and clubs. The second round were smaller local tournaments followed by regional finals. The regional winners then were invited to the Grand Finals in London. 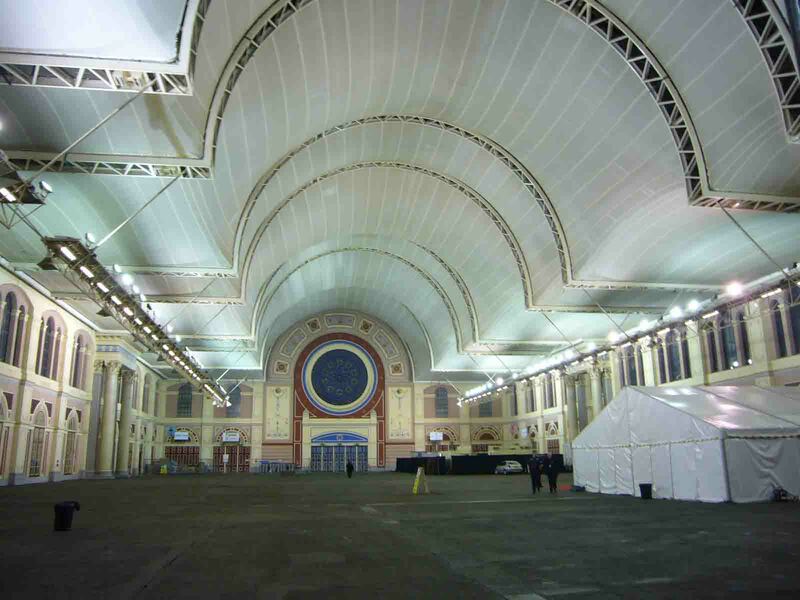 One of the venues was in 1963 - 1977 the Alexandra Palace (where now-a-days the PDC plays its World Championship), a few years later it was Wembley Arena (where the finals of the PDC Premier League are played). To the Grand Finals up to 17.000 fans turned up. Before Sky Sport started to televise the tournament people could follow it on radio and later on the final was recorded for TV. At the beginning of the 1970s Sky Sport started to televise darts tournaments. There was an unbelievable dart boom in Great Britain which suddenly stopped again in the 1980's so that TV withdrew. The "News of the World" felt the end of the boom only much later in 1990 when Sky Sport decided to stop to televise the tournament because people were no longer interested. That left for the players only one TV tournament - the BDO World Championship. Players got frustrated with their situation and with the BDO and the split in darts happened. Taylor said after the final that winning this tournament meant much more to him then all his at this time five World Championship titles together - the "News of the World" just were the tournament one had to win during those years it existed. And it was a tournament a simple pub player had the same chances to win as a darting hero due to the short format. The matches consisted throughout of three legs 501. Before the first leg the players threw for the bull to decide who would begin and should a third leg be necessary they did it again before the third leg. The tournament was organised mainly by employees of "News of the World" and their unpaid helpers - and to be sure a lot of work it was - who all were invited to the Grand Finals. Around 1950 Unicorn started to produce Signature Darts of the then "Darting Heroes" which were much in demand. Players who had thrown a 180 got a certificate. There was a close bond to Unicorn which showed as well when Unicorn signed a contract with two of the winners - first with Tom Barrett and some years later with Barry Twomlow - who then helped Unicorn to promote the sport of darts all over the world. After the second World War a few international players took part in the tournament as well, Stefan Lord from Sweden even won it twice something which beside him only six other players achieved: Tommy Gibbons, Tom Reddington, Tom Barret, Eric Bristow, Bobby George and Mike Gregory. A lot of the participants especially of the early years are today almost unknown and not much is known about them, but at their time they were unbelievable popular. An exception is Jim Pike, who reached during and after the second World War the peak of his careers and who is not forgotten till today.